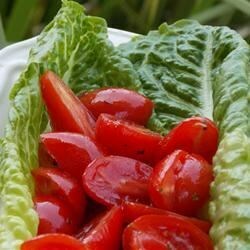 "Super simple yet delicious and beautiful, this grape tomato salad rounds out any meal adding loads of bright red color and tantalizing flavor. Sweetened rice vinegar adds a bit of sugar and acid, and the olive oil helps the body to absorb the lycopene in the tomatoes. Hint: replace the oregano with another dried spice that compliments your meal." Mix tomatoes, olive oil, rice vinegar, and garlic powder together in a bowl. Crumble oregano between fingers to release flavor and add to the tomatoes; stir to coat. Season with salt. Let flavors marinate before serving, 5 minutes or up to an hour. Spring into a delicious summer with a fresh caprese! Fast and easy for sure! I used 'Seasoned' Rice Vinegar & an Italian seasoning blend. Perfect summer lunch. This was pretty good, it just needed some pepper. I enjoyed this salad very much. I added some black pepper, but thought it had a great, unique flavor overall.